Happy Hump Day! It is winter and it is cold! That can only mean one thing. Truffle season!!! What better way to salivate and plan for what you would do to increase your gastronomical delight than by having us showcase our recent Truffle Trail experience at our favourite market in Prahran? 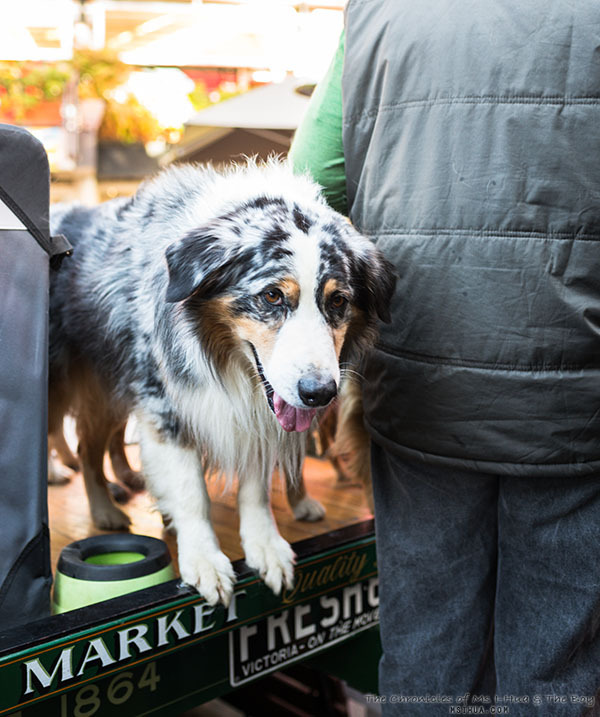 Towards the end of last month, Prahran Market threw a Truffle Trail party together with Truffle Melbourne. Like other previous food trail events hosted by Prahran, this was definitely worth a visit. If this comes up again next year, be sure to get your tickets quick and early as they sell out fast! At $45 per person, you can be guaranteed for a trufflelicious good time! You get a book of vouchers (7 all up) to visit participating stalls in the market. 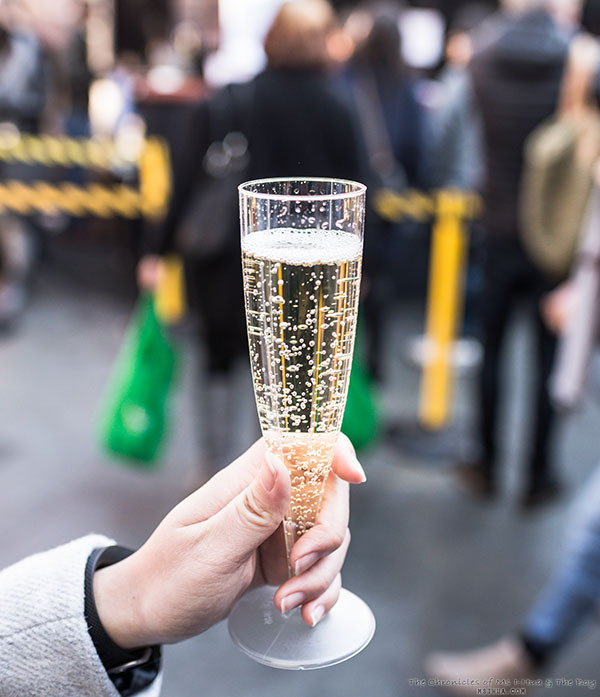 We started our trail with a complimentary glass of Mumm’s Champagne and Truffle and Gruyere Croquettes with Egg Yolk Jam. This dish was a special concoction from the Truffle Melbourne Tent which set up a pop-up stall at the Market Square area. 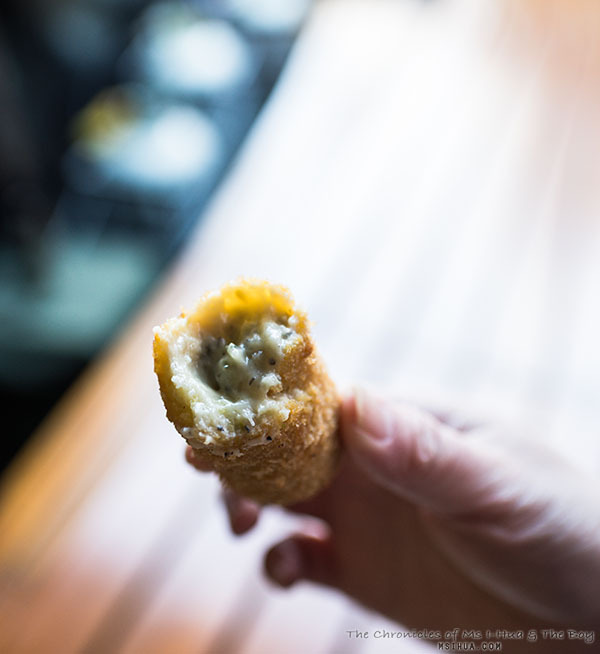 Seriously bloody good croquettes. And so generous with the truffles too! I was in heaven. 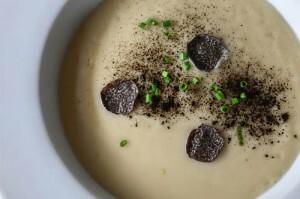 This was our favourite truffle dish on that day! We soon wandered around the market to collect the next couple of items on the list. 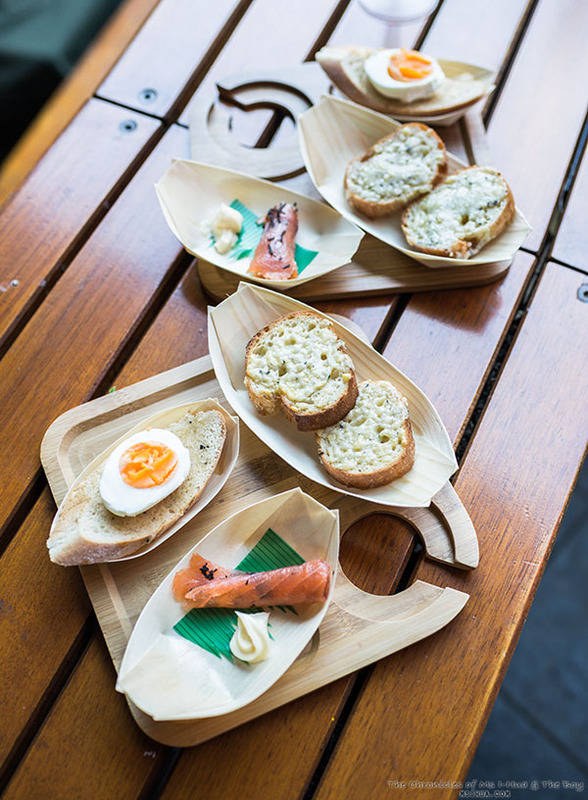 This included Claringbold’s Quality Seafood’s Smoked Salmon and Truffle Cigar (ZOMG); Damian Pike’s Truffle Infused Half Boiled Egg with Truffle Aioli on a Soft Brioche; and Cleo’s Deli’s Toasted English Truffle Cheddar with Watercress, Black Sea Salt and Pepe Saya Butter. If I hadn’t fallen in love with truffle and cheese before, I most certainly have fallen in love with it this time round! And Pepe Saya butter! So expensive, but I think it’s worth every cent! 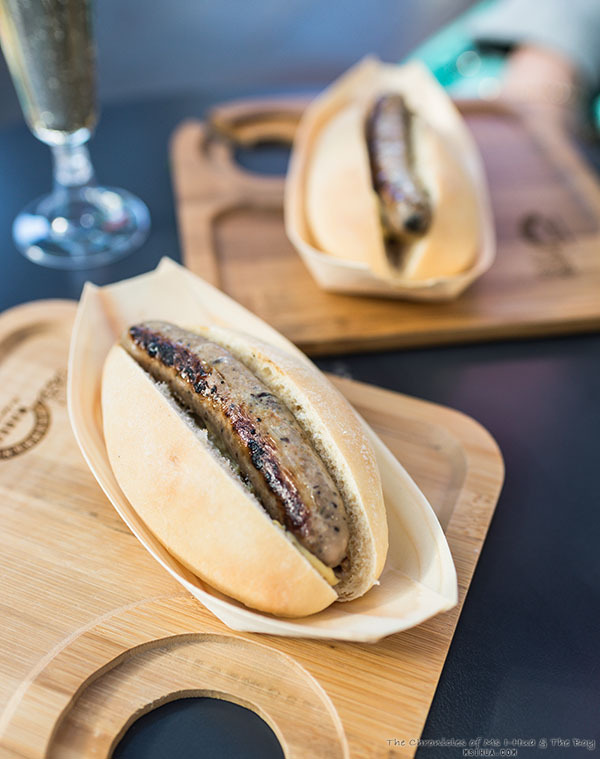 We decided to end with a hot savoury and dropped by Gary’s Quality Meats for their Gourmet Veal and Truffle Chipolata in a freshly baked roll. There was a huge crowd around their stand and I had people stopping me to ask me how they could join in on our Truffle Trail. The look on their faces when I told them the tickets had long been sold out! Poor poppets. We finished off with a little sweet treat from Chiccolato Lombardo for a Truffled Chocolate. It was so good! It also gave me an idea for my next dessert. We had a truly enjoyable time and filled our bellies much too easily with truffles, cheese and carb loading. I was also most excited to see the famous family of Brimfeldt Truffle Hunter Dogs, Spice (the master hunter) and her apprentices, Arrow, Trixie, Isadora and Ziva (I think Bailey was missing that day). I’ve memorised their names from the last time I saw them at the Truffle Melbourne event at Caulfield Racecourse because I am that tragic dog lover. I may or may not have told Arrow (pictured above) that I loved him. I also may or may not have gone up close and personal with Spice. I just think they are the most gorgeous looking dogs ever! (If you need to know, they are Australian Shepherd Dogs). If you need to get your hands onto some truffles and haven’t a clue where to get them, you can pay a visit to Damian Pike (the wild mushroom specialist) at Prahran Market. He sells them at $3 per gram. 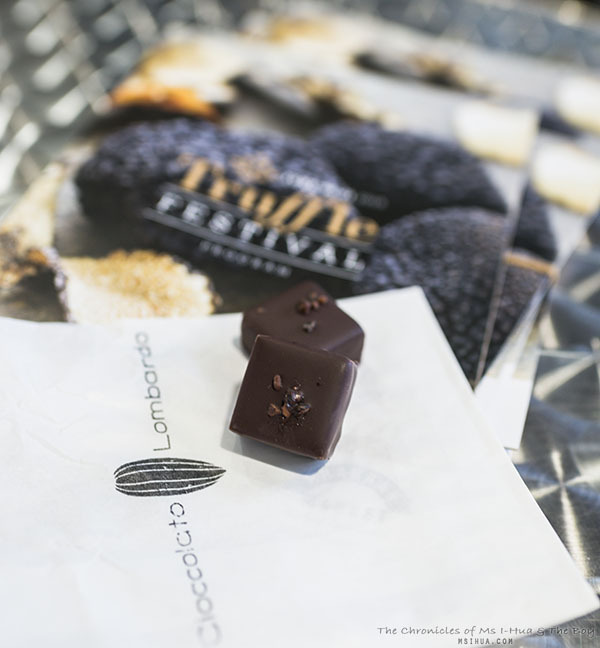 If this post has whetted your appetite and you feel the desperate need to get a handful (or fingerful) of truffles, don’t forget to visit this year’s Truffle Melbourne event at The Centre in Ivanhoe on July 11 and 12, 2015. Book your weekend festival tickets here. 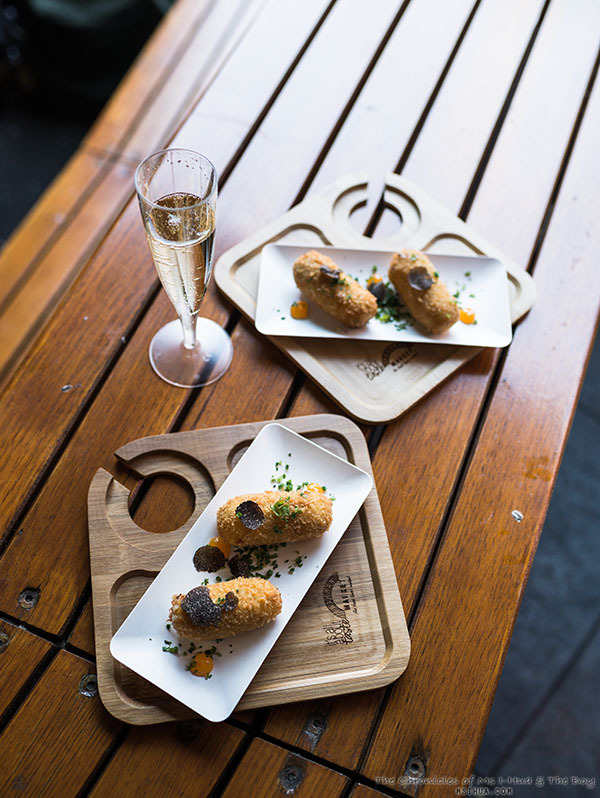 We started our trail with a complimentary glass of Mumm’s Champagne and Truffle and Gruyere Croquettes with Egg Yolk Jam. And so generous with the truffles too! I was in heaven.